Search engines are about "news"
The most popular searches on Google in 2014 were almost entirely about major news items. 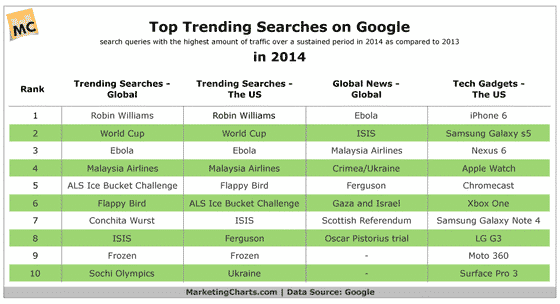 An analysis of search trends for the past 12 months shows that the most requested item was anything to do with Robin Williams – more popular than the football World Cup, which was in second place. Almost all of the items in the Top 10 popularity stakes on Google were major events, or significant product launches, such as the Disney movie, Frozen. The research demonstrates that when something is “in the news” we tend to go to Google to find out more. That should be a clue to anyone with a website. The data shows that even though we are now surrounded by digital information, our fundamental behaviour has not changed that much. When something happens in “our world” we want to find out more about it. So, rather than spending hours and hours on keyword selection and trying to get your website up the search engine rankings you could better if you spent those hours creating “news” which people then search for. Remember, people did not just suddenly go to Google to find out more about the death of Robin Williams – they heard about it first on TV, Radio, on social media and so on. In other words, those websites covering the story benefited from the sad item being “in the news”. Get yourself “in the news” and you will get more search engine traffic. But how do you go about that? What is “news” and how do you create it? News is “new” – that much is obvious. But new does not mean brand new; it means that it is novel information, something that the recipient has never heard before. So, it is not news to me that I have an Acer laptop. But that is “news” to you because (unless you know me personally) you did not know that. There is tons of information within your business that is new to people – because you already know it, you tend to think it is not news. But it is news if other people do not know it. However, being told the brand of laptop I own is not really that interesting, even though it is new to you. So, it would hardly cause an international stir with millions of people searching for the details on Google. News has to be exciting. Not only does it have to be new, but it has to be relevant to the audience you are targeting. The death of Robin Williams would have been of no real relevance to those people who did not like his movies, indeed to the millions of people in the world who had never even heard of him. Plus news has to be unusual – something out of the ordinary. Knowing I have an Acer laptop is not unusual. But if it were made of cardboard, then that would be unusual and would make “the news”. So, within your business there are bound to be things which you think are old, but which other people do not know about and would find unusual. Focus on those things and let journalists know about them. Get coverage in trade and professional journals as well as local newspapers. Get people talking about it. Then people will search for it – and because the news item is specific to you, those searches will inevitably lead to your website. The biggest boost to your SEO you could do this year is to concentrate on producing more news. Oh – and one other thing – as any SEO specialist will tell you, Google just loves new and fresh material. So if it is “news” you get added search engine benefits anyway. If you have a choice of where to spend your search marketing money in 2015, putting a greater slice of the budget into news generation will have a real impact. You might not be up there in the global trends when we look at the data at the end of the year, but you could well be top in your sector or local area.